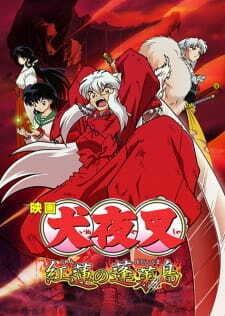 fire on the mystic island, the fourth and last inuyasha movie to date. well, seeing that this one has no reviews on it, i will do the honors of writing it one. as an inuyasha movie, this one had some of the typical characteristic aspects to it as such: fighting demons, romance, jokes/humor, an event that happened in the past brought back, and the group coming to the rescue once again. this one played more on mythology that i found to be enjoyable and expanded on the half demon relationship with the world. it had a suiting story line to carry on like that of the first and second movies. the one big thing i noticed about this movie was how similar the art was to the anime itself. it seems that from the first movie that was different, they slowly made their way back to this point where the fourth one is almost the same but not quite. i found that to be very appealing on the eyes and familiar as an inuyasha fan. the music in this movie was was beautiful and fitting to me. it sounded like something that belonged with an inuyasha movie and was rather beautiful. oh and don't forget that the english voices that gave the characters their personality, despite others ripping on the english dubs, are all back in action. this movie kept my attention with some of the cuter points in it and the back story to it i found enjoyable/fitting of an inuyasha movie. overall, i found it to be a good movie and i would re watch it anytime. i'm just sad that the movies are over now xD i want more! When people said this movie was just filler and unneeded, I was expecting just another okay Inuyasha movie. I didn't get that. Instead I got what came out as my second favourite Inuyasha movie. I don't like to think of it as filler, as pretty much all the Inuyasha movies are "filler". I really enjoyed this movie. It was way better than the first two and I thought it was a great end to the Inuyasha anime for me, because the second the movie ended, I'd seen everything Inuyasha. It left me pretty satisfied and yet still wanting more Inuyasha movies. The action was amazing, not as good as the third one, but heaps better than the first two. One thing I'm sick and tied of is the soundtrack.. STOP IT! There was one original remix that I noticed (that had the tune from the tv series) but I didn't notice anything different about the soundtrack. I listened to the soundtrack throughout the whole anime series. So why did I need to hear the same damn thing in the movies? I mean come on. We need some originals people. Anyways, I liked this movie and I don't really know what everyone was talking about, this is a FANTASTIC movie. I loved it.